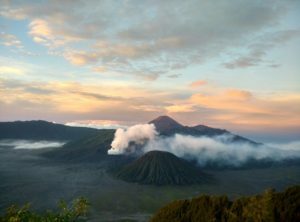 This tour below is a very laid back trip with main destination of Mt Bromo and Ijen Crater. It is not a rushing tour from one place to another. You will get to relax in a resort and enjoy the vicinity of the resort more. Yet not just relaxing, you will also still get to explore ad experience more , like Rafting at Pekalen river and soft trekking to Madakaripura Waterfall. Inform us if you want this itinerary to be customized. Depart at 01.00 from hotel to Paltuding and trekking about 1 hour to see Ijen Blue Fire phenomenon. About 07.00 descend and stop by at Rubber, Gloves and Coffee Plantation. Return to hotel. Rest and free program. About 15.oo walk around to rice field located nearby the resort. Depart at 03.00 from hotel by 4WD to Mt Penanjakan to see sunrise and then drive to see of sand and walk about 30 minutes to Mt Bromo crater rim. You will see breathtaking view of Mt Semeru, Mt Penanjakan, Mt Batok and surrounding panorama. Return to hotel, breakfast and then drive to Pekalen River, to enjoy fun rafting with NOARS RAFTING. Along the rafting trip you will pass waterfall, rice field, farms, and kampong. Return to hotel. ETA:15.00. Breakfast at 07.00 and then drive to Madakaripura Waterfall, which can be reached about 30 minutes walk. Afterwards drive to Surabaya, if you still have time then Surabaya city tour until we drop you to airport. End of Service.